Today’s photos might look a little like something out of a vintage science-fiction film, but they are, in fact, pictures of real early-20th Century medical treatments. These treatments were carried out in some of children’s homes that were run by The Children’s Society (then known as the Waifs and Strays Society) and they both involve light. You may have heard that exposure to sunlight helps our bodies to synthesise vitamin D, and that a lack of vitamin D can lead to rickets. It’s perhaps not surprising, then, that the children’s homes which carried out this light therapy were ones that looked after children with orthopaedic problems. 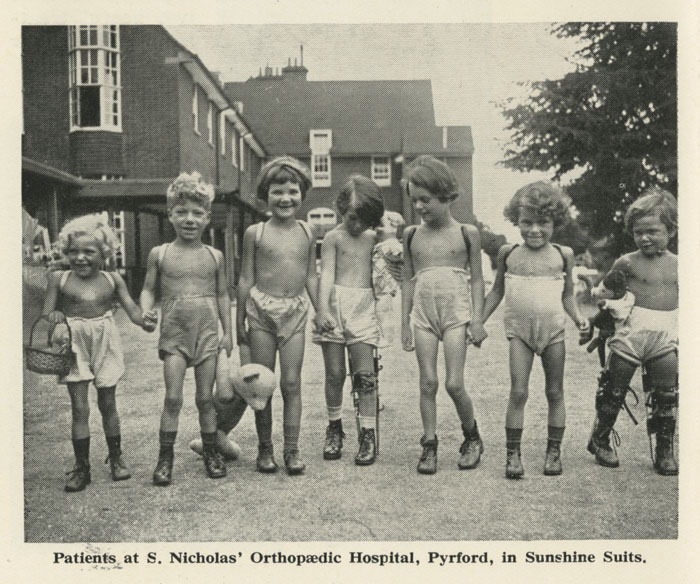 As well as cases of rickets, The Children’s Society’s orthopaedic homes often looked after children who were suffering from tubercular diseases of the bones and joints. Light therapy could be used to treat these diseases too, as light kills the tuberculosis bacteria. 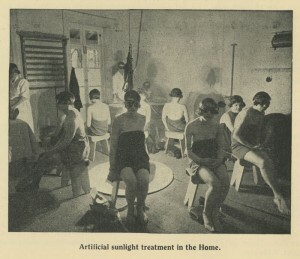 The most obvious way to carry out light therapy is to expose the patient to sunlight, as in the photo below from 1927. These children at St Nicholas’ and St Martin’s Orthopaedic Hospital and Special School in Pyrford, Surrey, are wearing what the caption calls ‘sunshine suits’. To me these suits look rather like a pair of swimming shorts or underpants (and baggy ones at that!) It would seem that the aim was for the children to wear minimal clothing so that as much of their skin as possible could be exposed to the sunlight while they played outside. However, as the British weather means that sunlight can’t be relied upon at all times, some of the homes also carried out artificial light therapy using electric lights. In the above photo from 1937 we see girls at Halliwick School in Winchmore Hill, London, undergoing this ‘artificial sunlight’ treatment. The girls are sitting so that the skin on their backs is exposed to the electric light, while they are wearing goggles to protect their eyes. 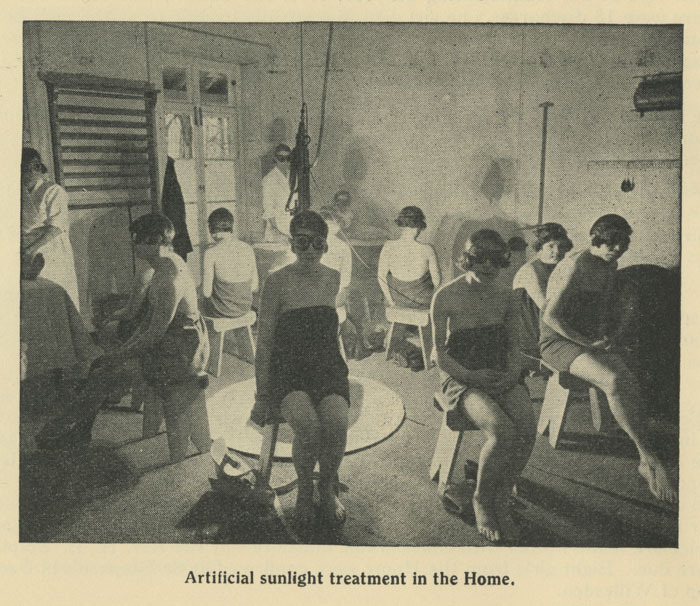 From these photos and from others that I’ve come across in the archives, it seems that light therapy, be it natural or artificial, was a very popular treatment in The Children’s Society’s orthopaedic homes during the early-20th Century. When was this treatment first used and how successful was it for the patients? We won’t know without further research. Anyone interested? Please contact us (Hidden-Lives-Revealed@childrenssociety.org.uk) if you are, or if you’d like to use the archive for any other research projects. This entry was posted in Unexplored Riches in Medical History and tagged Children's homes, light therapy, medicines and medical treatments by Janine Stanford. Bookmark the permalink.